This is yet another photo from the envelope marked “Sammie’s Friends“. Unfortunately, there is no date or writing on the back of this photo so I don’t know much. I do know who this beautiful woman is now! It’s Jinks from last week’s Throwback Thursday. From what I gather, Sammie and Jinks went to high school together and were close friends. Sammie Brown is on the left. I wonder what they were doing? It looks like they are dressed up in their fancy clothes and I see what looks like a theater marquee behind them. Look at Jinks’ beautiful corsage. 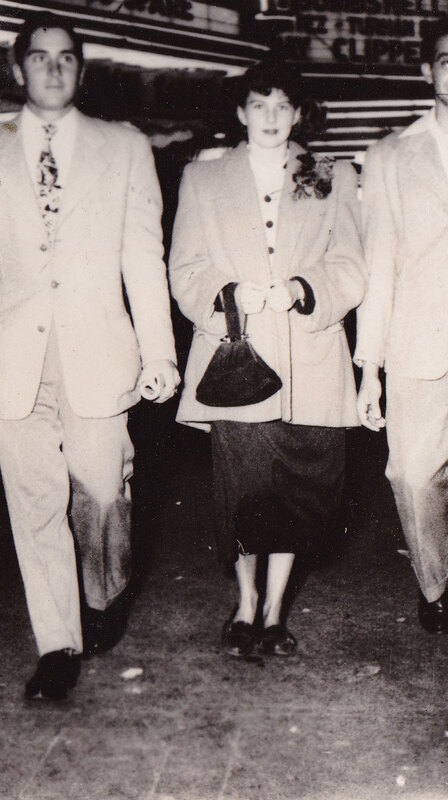 I think we should bring those back as a fashion accessory and hats too. She looks so classy and elegant. The men too. Thanks to last week’s post and help from a local community group on Facebook, I was able to find Jinks’ family. Both of the pictures I featured on this blog are being sent to her family. These will be the third and fourth pictures from my collection that I was able to get to the families. I’ve enjoyed this project so much and have started learning more about my community. Stayed tuned, I have more to come. Happy as a Pig in…. MUD! What did you think I was gonna say?! It’s been a long time since I’ve done an update about the hogs. People are asking me about them and how they are doing. I am biased but I think they are doing really well. 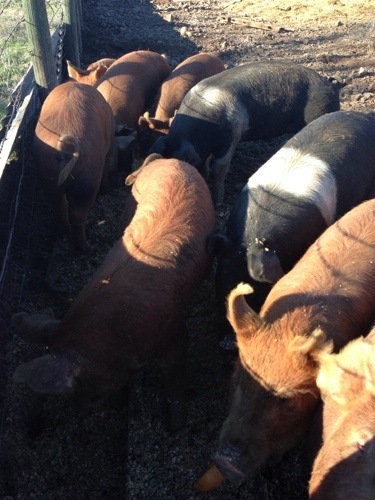 You remember that this year I doubled my hog herd – from 5 red wattles, to 8 red wattle and 2 hampshire hogs. I got the two hamp hogs as an experiment. I want to compare how a commercial hog and a heritage hog taste when they’ve been fed the same diet. But that is for another blog…. The most interesting pig in the world, sharks have a week dedicated to him. Let’s start with their diet. I cook all their food. I fire up my fire ring in my front yard, gather my ingredients and proceed to make hog slop that I have a had time NOT eating. 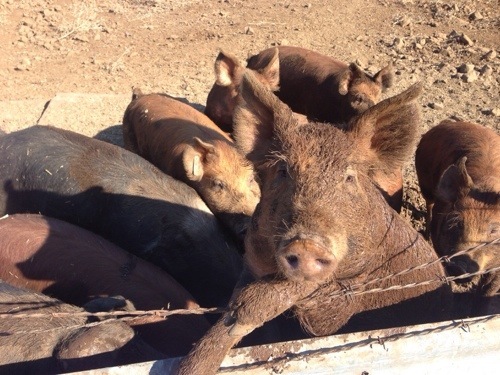 Let me explain – I learned a lot from last year’s pigs. 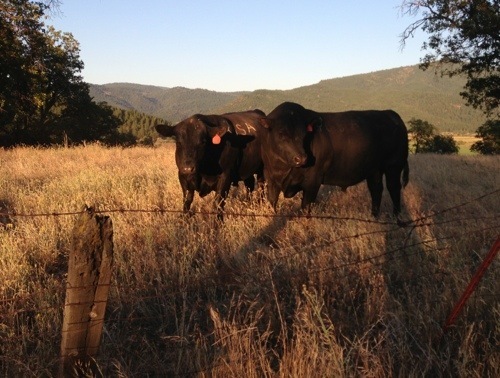 I learned that, just like my beef, what I feed them does influence the meat’s flavor. Remember that scene in Napoleon Dynamite where Napoleon drinks the milk at the FFA judging day and says “this tastes like the cow got into an onion patch,” well that’s true with meat too. 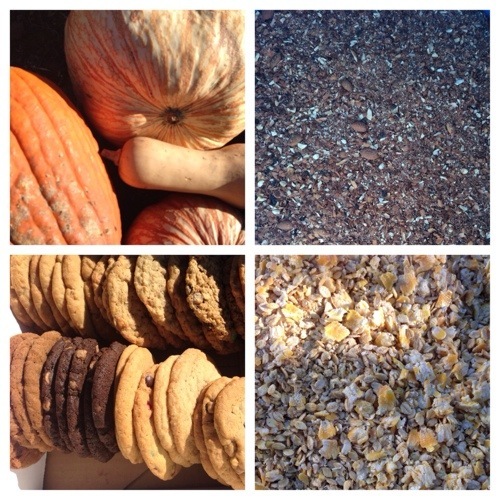 Pumpkins, almond parts, cookies, and rolled barely/corn. I feel like this year I’ve really dialed in my pig rations. The pigs love their food and scream and oink at me when they know I am cooking for them. This year, in addition to the corn/barley, pumpkins and organic almonds, I added day old cookies from The Cookie Shoppe!! The cookies make the cooking slop smell like baking cookings and it is glorious, hence the problem I’ve been having with wanting to eat the pig’s slop (I haven’t, yet). My supplement “cooking” pot for the pigs. The pigs are eating so much now, I usually cook twice a week. I’ve slowly been increasing the amount of almond meal they are getting. You see nut finished pork is a thing of beauty. When I introduced the almonds into their slop, I could literally SEE them growing. 10 pigs fighting for trough time. I would be lying if I didn’t say, it is terrifying. Having 10 pigs has been a learning experience for me, it’s also been a tremendous amount of work. There is no way that I would have been able to raise these pigs if I would have had a job in town. I spend hours everyday caring for these hogs. Granted, I could be more efficient, by not cooking slop, using an automatic feeder, and using a commercial breed that would grow faster. But, it’s not about that for me. After a lifetime of raising our own meat, I’m a spoiled rotten meat snob. I want to grow and eat a product that no one else can. Simply, I want the best. Honestly, if you were in my position you’d feel the same way. This is my favorite pig. He just looks happy. The pigs are so big now, they are starting to get scary. I have to be careful when I feed them to keep my hands out of their way. They get into a frenzy when it’s mealtime and they could care less if they are biting a pumpkin piece of biting off one of my fingers. Out of all the animals of the ranch, the pigs scare me. They are omnivores, and I have heard enough horror stories about pigs eating people to know this is serious business (also friends, remember when your baby daughter start dating, remind the date that your daughter’s Aunt Meg has pigs and to mind their manners). 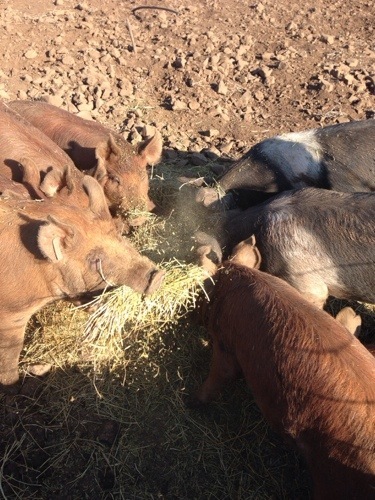 We cleaned a barn out, the pigs got the old hay, and they thought they died and went to pig heaven. A lot of ‘pig of the mountain’ was played. I have been deeply pleased with the attention my pigs have been getting. 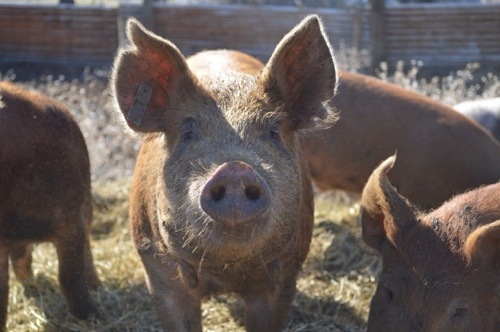 More people are becoming aware of the difference between heritage and commercial hogs and the demand is increasing. In fact, my “List” for pigs surpassed the amount of pigs I got before I even got the piglets home. That definitely offset the anxiety I had investing almost all of my cash into my pork futures. I am a firm believer that you get what you pay for when it comes to livestock, and paying extra for heritage, healthy, female-farmer raised piglets was worth the money for me. Have I mentioned how much they love hay? I have to replace their bedding hay often because they eat it! It probably doesn’t help that I use Dad’s meadow hay instead of straw! 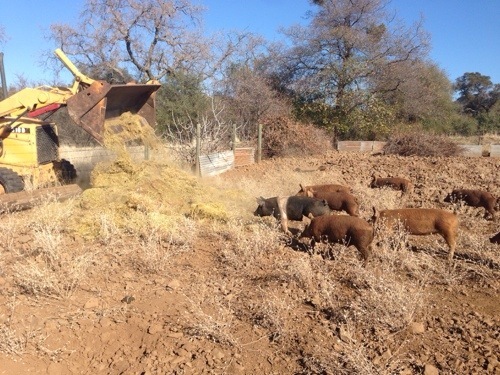 The pigs have it good, a custom diet, a mountain of hay to play in, and lots of space to have pig races. 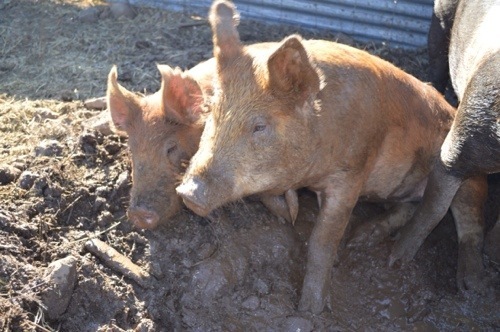 I’m getting ready to make the appointment for the two hamp hogs, they are almost finished. 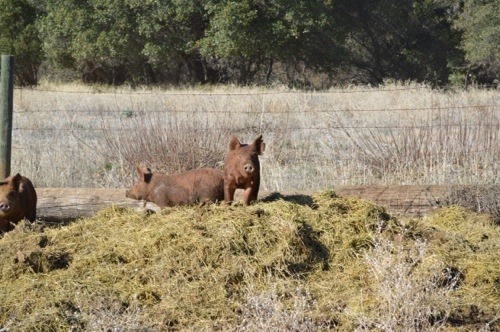 The red wattle hogs still have at least a month before they are bacon. Until then, it is good to be one of my pigs! It was a huge week for me. Two big things happened. The first big thing has taken years of me begging, planning and cajoling. My Parents gave me their blessing to raise pigs again. That’s right, I am going to get some weaner pigs to finish and eat! There is nothing like home grown pork, nothing! 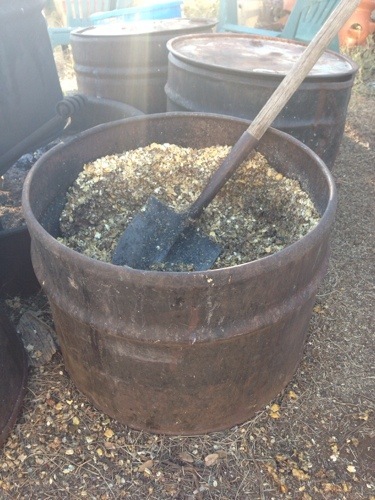 I’m in the beginning stages of my pig plan, so you’ll be reading a lot more about the process soon. The second big thing, and this is rare, actually now that I think about this, this is the first time this has ever happened. My Dad gave ME some hay. To sell. To the public. I feel important! MY hay! Mine, mine, mine! I know, I know, I couldn’t believe it either. Usually my Dad has a handful of people that he will sell hay to, but these are inner circle of Brown Family friends. Most of our hay is saved for our cattle and horses in the winter. So imagine my surprise when my Dad showed up on the winter ranch with a loaded trailer of fancy Indian Valley hay and told me if I could sell it, it was mine! It’s like Christmas! Fancy pants, laser leveled, irrigated, non-sprayed hay field. I’m not even allowed to change the water in this field, yet. Or drive in it. If you are not familiar with Indian Valley, California, it’s famous for two things, the Silver Buckle Rodeo and its hay. And this hay lives up to its reputation. Indian Valley hay field. Makes me feel like a little kid again! This hay is second cutting mammoth red clover, Dutch red clover, rye grass, orchard grass with a whisper of vetch, horse hay quality. It’s all natural, no sprays, fertilized with last year’s cow poo. Joe, Leo and Sue get a flake every night and they love it. Our horses all tend to live well into their late 20’s – I firmly believe it’s because they get super good nutrition – this hay being part of that. The hay is $12 a bale or $11 if you buy more than 20 bales. I only have a flatbed of this stuff, so I’m anticipating it will go fast (although it was mentioned that there MIGHT be one more load, maybe). If you are interested let me know at megrbrown@gmail.com. Thanks!